Moonstone is a gemstone variety of the mineral feldspar, a gemstone with a vitreous luster and a hardness only slightly less than that of quartz crystal. Moonstone exhibits a blue shimmering reflective sheen that gemologists call "blue adularescence." 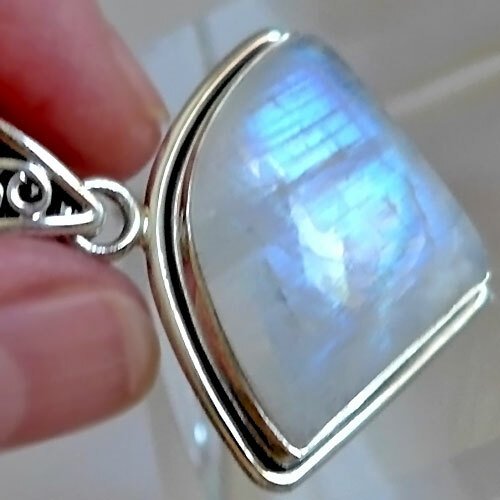 This means that the Moonstone shines with a spectral lustre that flashes blue in different lights, or as the gemstone is rotated in the line of sight. Moonstone produces a wavy multi-colored band of light; like a cat's-eye, with rays ranging from pearly white to violet to electric blue. Read more about Moonstone in our Crystalpedia.